The Lesser Scaup is s one of the most abundant and widespread North American ducks. It forages by diving underwater to capture mollusks, crustaceans, and aquatic insects. The Lesser Scaup is found in Tennessee during the winter, and especially during migration, when they can form large rafts* with other species of diving duck. Lesser Scaup breed in wetlands and lakes in the boreal forest from central Alaska to central Canada, southward to the northern United States. Individuals winter on ice-free freshwater bays, lakes and wetlands across the United States, southward to northern South America and in the Caribbean. 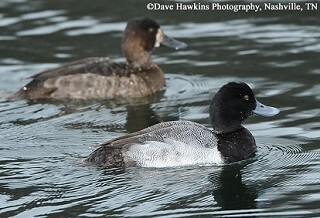 Description: The Lesser Scaup has a slight bump or peak on the back of the head. The male’s head looks dark but has a purplish iridescence in good light. The neck, chest and hind-end are black, the back is gray, and the sides are white. The female is overall brown, with a white band at the base of the bill. In flight, white extends less than halfway out on the wing. Voice: The female gives a grating garf, garf. The male makes a faint whistled whe-o in courtship. Greater Scaup look very similar but are slightly larger, and have a rounder head. The male’s head has a green gloss in good light. In flight, there is more white in the wing. Male Ring-necked Ducks have a black back, a more pronounced bump on the back of the head, and a white ring on the bill. The female has an eye-ring and lacks the white band around the base of the bill. Habitat: In Tennessee, they are found on ponds, lakes and rivers. Diet: Snails, crustaceans, aquatic insects, seeds, and aquatic plants. Status in Tennessee: The Lesser Scaup is a fairly common winter resident, with greater numbers in the state during spring and fall migration. It arrives in late October and most migrants and wintering birds depart by early May. Many species of ducks are known to lay their eggs in the nests of other ducks. The eggs of several species have been found in Lesser Scaup nests, including Redheads, Gadwall, White-winged Scoters, Ruddy Ducks, Canvasbacks, Red-breasted Mergansers, and other Lesser Scaup. Lesser Scaup eggs have been found in the nests of Gadwall, Northern Shovelers, Redheads, White-winged Scoters, and Canvasbacks. The oldest known Lesser Scaup in the wild was 18 years, 4 months old. Best places to see in Tennessee: Reelfoot Lake, South Holston Lake, and other state and federal waterfowl refuges in Tennessee. Large rafts may be seen from Paris Landing State Park and Tennessee NWR-Big Sandy Unit. Austin, J. E., C. M. Custer, and A. D. Afton. 1998. Lesser Scaup (Aythya affinis). The Birds of North America, No. 338 (A. Poole and F. Gill, eds.). The Birds of North America, Inc., Philadelphia, PA.
* A raft is the name given to a large number of ducks on the water.